Optimum Nutrition is maybe the biggest name in the supplement industry. They make the most popular protein powder on the market, Gold Standard Whey, and their branched chain amino acid supplement Gold Standard BCAA is one of the best BCAAs available. 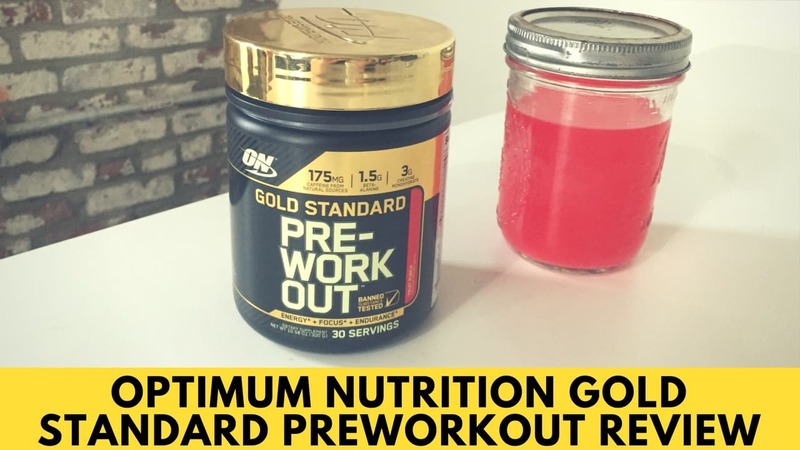 They sell a few supplements designed to fuel workouts, including Essential Amino Energy and a caffeine and whey product, but we naturally wanted to try what they consider their Gold Standard Pre-Workout. Is it as impressive as their other offerings? One scoop provides 10 calories and 2 grams of carbohydrates. 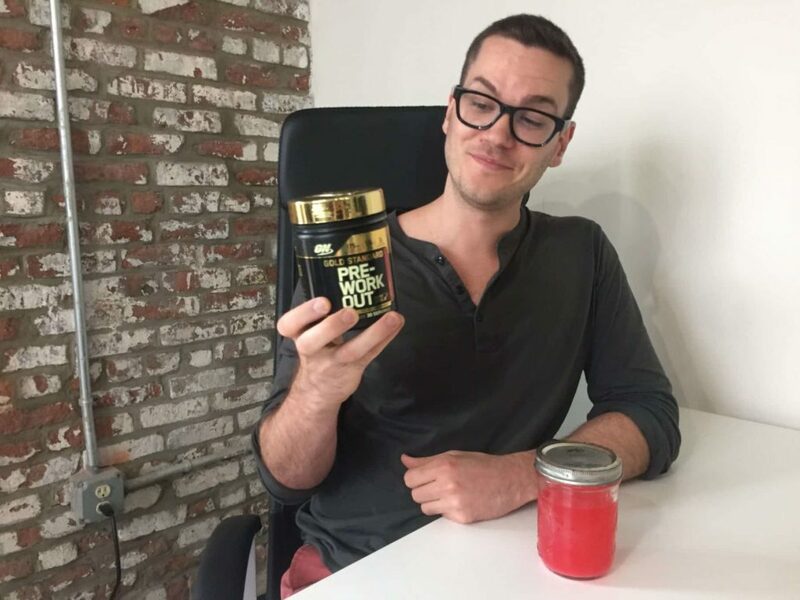 The first thing I look for in a pre-workout is a caffeine dosage, and Gold Standard Pre-Workout has 175 milligrams of the stuff. That’s a little less than you’ll find in two cups of coffee. The caffeine is in the “Energy & Focus Complex,” which also includes 375mg of Acetyl-L-Carnitine HCI, 250mg of N-Acetyl-L-Tyrosine, and 100mg of a Citrus Bioflavinoids Complex. I’ll discuss the benefits of all of these ingredients in the next section. There’s also the “Muscle Matrix,” which has 3 grams of creatine and 25mg of AstraGIN, a proprietary blend of astragalus root extract and Panax notoginseng root extract. The other blend is called the “Performance Composite,” which consists of 1.5 grams of beta-alanine and 750mg of L-Citrulline. 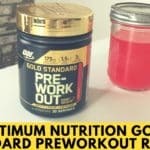 Gold Standard Pre-Workout also has a remarkable amount of vitamins, with over 100 percent of the RDI of five B-vitamins, 50 percent of your daily folic acid, and 125 percent of your daily Vitamin D.
Finally there are the “Other Ingredients,” which are mostly natural flavors and sweeteners like malic acid and citric acid, artificial flavors and sweeteners like sucralose and acesulfame potassium, anti-caking agents like silicon dioxide and calcium silicate, and gums like cellulose gum and carrageenan. The other ingredients in the Energy & Focus Blend include Acetyl-L-Carnitine HCI, which may improve blood flow and alertness, and N-Acetyl-L-Tyrosine, a highly absorbable form of tyrosine which may help with stress and alertness. The Performance Composite, which has beta-alanine and l-citrulline, may improve endurance and blood flow, while the Muscle Matrix’s creatine may help with power output. The astragalus root/ginseng root extract is mostly linked to immunity. This might seem like a strange addition, but ON’s Gold Standard BCAA also has a big focus on immunity. The idea is that immunity is an undervalued component of recovery and important if you want to be able to keep tackling your next workouts, which is fair. One potential issue with this supplement is that the AstraGIN is present in a pretty small quantity: 25 milligrams. Usually, it’s recommended that astragalus be taken at dosages of 250 milligrams. Indeed, that’s an issue with a few of the ingredients in Gold Standard Pre-Workout. There’s 750mg of citrulline, though 6 grams is what’s usually recommended for workout performance. There’s 250mg of tyrosine, but typical doses for this amino acid are over 500mg. That’s not to say that these ingredients won’t provide any benefit whatsoever, but it leads me to focus more on the other ingredients. There’s a good amount of beta alanine, l-carnitine, and the other ingredients, so I do believe that this product can have a positive effect on endurance and alertness during your workout. Finally, the vitamins are a nice addition. Adequate intake of B-vitamins and Vitamin D are linked to better energy levels and hormonal health, it’s just important to note that this does not mean they’re stimulants. Rather, their addition may help shore up vitamin deficiencies in people who are low in these vitamins, thereby leading to better energy levels. This effect will only be felt by people who were already deficient, and probably not right after taking this pre-workout. Prices vary, but a tub of 30 servings usually goes for $29, or a little less than a dollar per serving. 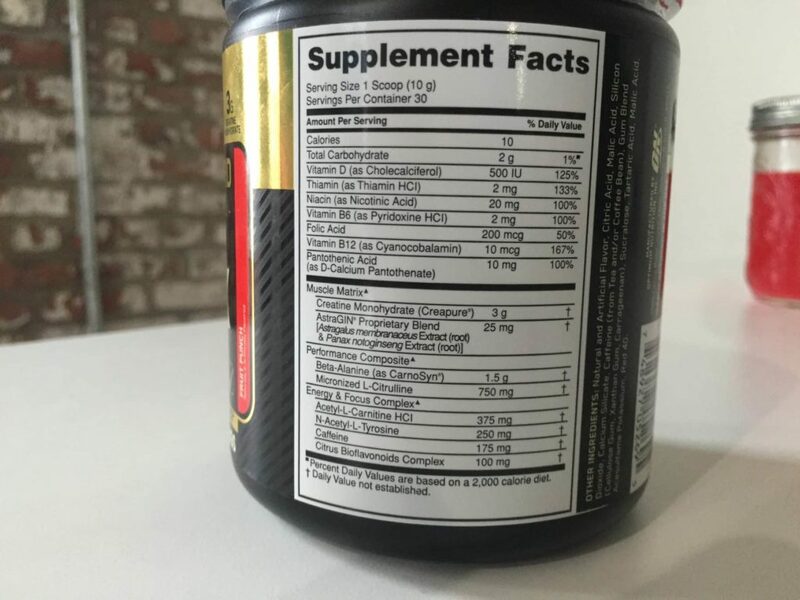 Relatively speaking it’s on the higher end of most popular pre-workouts, but most competitors, like Cellucor’s C4, BSN’s N.O.-Xplode, and GAT’s Nitraflex fall between 25 and 30 dollars per 30 servings. 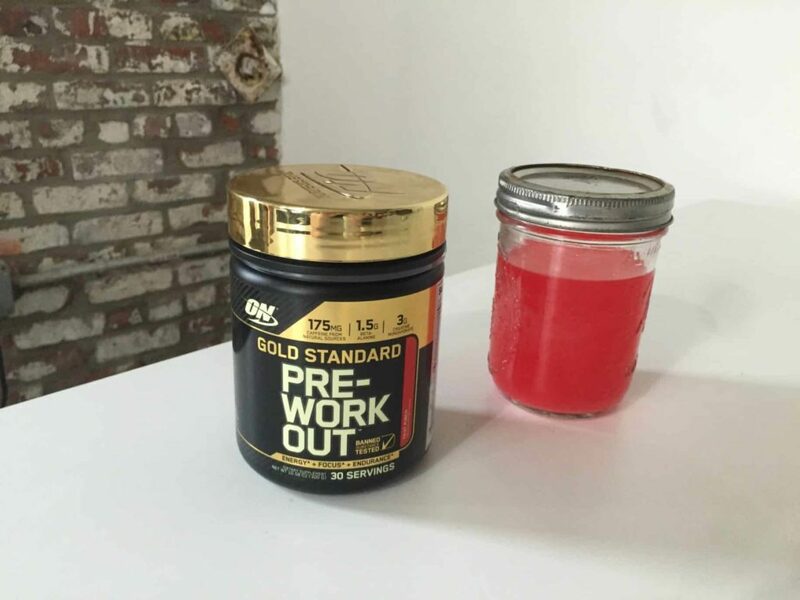 So while Gold Standard Pre-Workout is technically on the pricier side, it isn’t by a wide margin. I picked up the Fruit Punch flavor and the taste was pretty standard: maraschino cherry and watermelon candy combined. It reminded me a little bit of Post JYM Active Matrix in that it also had a hint of bubblegum flavor. The Gold Standard Whey and BCAAs were among my favorites, but I don’t feel quite as strongly about the pre-workout. This is mostly because a couple of the ingredients are present in small amounts. However, I liked the multi-pronged approach of boosting energy, endurance, focus, and vitamin intake. If you want a hit of energy and vitamins that won’t keep you up all night — and so long as you’re OK with the artificial ingredients — this is a solid option.